You should find a member of the staff in the Learning Studio (typically Matt Dickerson) and Auditorium (typically Jeff Chandler) each day that you have class. Most of the remaining staff office in the lower level of the Health Sciences Library. We offer many tools to help you with you technical issues including our step by step walk throughs. From a brief intro into the new online system to Accessing EPIC on your personal device, there are many tutorials made to make your experience easier. As a future M3, you will be spending your time in clinical (health system) buildings, and as such we need to make sure you have your laptops and mobile devices configured appropriately. This means your devices should be configured to connect to Health System wireless networks and you should confirm you have access to (and are regularly checking) your Health System email account. 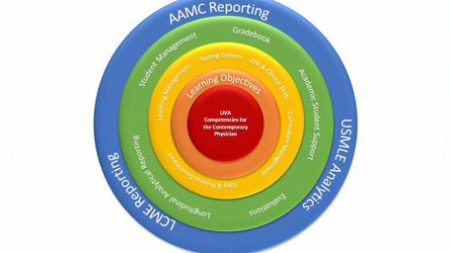 VMED, which stands for Virginia Medicine, is an integrated learning-, curriculum-, and student-management system designed with the specific needs of UVA in mind. The most reliable way to contact us is via email to mededweb@virginia.edu.